2.Enter coupon code TRGGFU to get your promo code. 3.Proceed by clicking on continue. P.S. - Site is quite slow at present because of high load , but keep on trying . Many people have already ordered. -This gift is valid till 30th June 2015 only. -Once the user places an order for the gift it will take effectively 14 to 21 working days to deliver the offer. 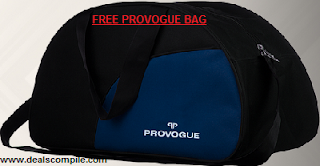 -Order for Travel Bag has to be placed online after redeeming the code. -Two schemes cannot be clubbed together. -This gift will be delivered only in India.